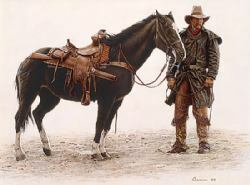 To create the scene that would become Heading for Higher Ground, artist James Bama called upon his friend Jim Williams. Williams, says Bama, is a “real modern-day mountain man. He used to trap and he lived in the Southwest in a cave. He had an old-fashioned porcelain bathtub and all that you would expect. He’s a terrific guy.” With Williams signed on to model for the painting, they traveled to nearby Rimrock Dude Ranch to borrow a horse for the day.